The Senator Miriam Defensor-Santiago newest Pick Up Lines on Pork Barrel scam can be viewed here. Senator Miriam finds way how to make the scam issue become more interesting to all. Please scroll down this page to see the highlights of her pick up lines. Miriam used pick up lines for her statement on the event of the Philippine Blood Coordinating Council. "Lahat ng iyan mga Walking Dead yan eh!, ang kapal ng mga mukha"
"The brain of the Filipino politician has two sides, the left has nothing right in it, the right side has nothing left in it." Holduper: Holdup ito, Akin na pera mo. Cong: Hindi mo ba ako kilala, isa akong congressman. Holduper: Kung Ganun, Akin na pera namin. "Anu man ang gawin mo sa buhay, ibigay mo 100% mo, maliban na lang kung nagdodonate ka ng dugo." Senator Miriam is now on leave because of her health condition, she was schedule to go abroad soon. 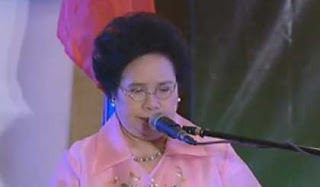 If you want to watch the video of Miriam's statement, just click here. Comments or suggestions about "Miriam Defensor-Santiago Newest Pick Up Lines on Pork Barrel Scam" is important to us, you may share it by using the comment box below.